WHO's international guidelines, written and physical standards developed under the aegis of this Expert Committee for more than 60 years are designed to serve all Member States, international organizations, United Nations agencies, regional and interregional harmonization efforts, and underpin important initiatives, including the prequalification of medicines, the Roll Back Malaria Programme, Stop TB, essential medicines and medicines for children. 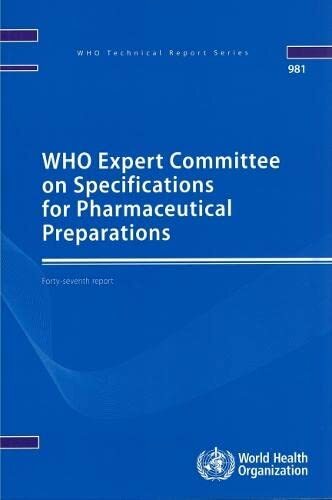 The Forty-seventh WHO Expert Committee on Specifications for Pharmaceutical Preparations adopted 26 new monographs and general texts for inclusion in The International Pharmacopoeia,/I>. The specifications under development are internationally applicable test methodologies for anti-infective, antimalarial, antituberculosis, contraceptives and antiretroviral medicines, as well as medicines for children. * Collaborative procedure between the WHO Prequalification of Medicines Programme and national medicines regulatory authorities in the assessment and accelerated national registration of WHO-prequalified pharmaceutical products (new).